Vintage long pendent platinum cocktail ear jewels abundantly set with diamonds: Description by Adin Antique Jewelry. 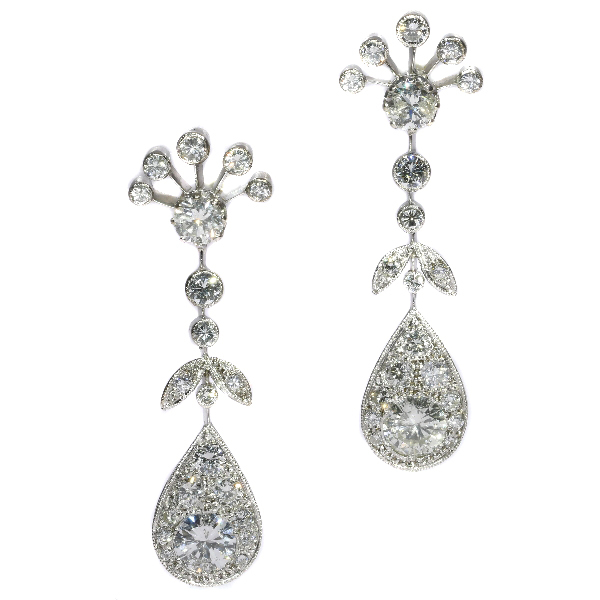 Style specifics: This type of jewelry is very specific for the fifties of the twentieth century. The Art Deco period preceded only 20 years and was still used as source of inspiration, it is (even for the trained eye) sometimes very hard to note the difference between Art Deco and Fifties. Diamond(s): Two brilliant cut diamonds with an estimated weight of ± 2.00ct. Two brilliant cut diamonds with an estimated weight of ± 1.03ct. 38 brilliant cut diamonds with an estimated weight of ± 2.53ct. Total diamond count: 42 pcs. Total diamond weight: approx. 5.54 crt. with an average colour and clarity: J/L, si/i.